When it comes to buying a new bike everyone knows the importance of purchasing the correct frame and size. Bike Science can help ensure you avoid costly mistakes with a pre-purchase sizing on our fully adjustable fitting bikes. No matter what make or model you’re considering, find out if it’ll fit before you buy. Bike manufacturers use a number of different ways to state the size of their frames, but they’re rarely consistent across different brands so a small from one brand won’t always be the same as a small from another.In this article, I’ll outline the different methods used by manufacturers to size their frames. As you’ll see it can still be confusing! There are a few key phrases you’ll come across a lot when sizing your next bike and some of which will be more help than others. Until recently most frames had their sizes listed according to the length of their seat tube (See the diagram above for an explanation of each tube’s name) but there are three different ways of measuring it. The first is called centre to centre, or C-C, which measures from the centre of the bottom bracket to the centre of the junction between the top tube and seat tube. The second is called centre to top, or C-T, which measures from the centre of the bottom bracket to the top of the seat tube. These are common measurements that you’ll always find on manufacturer’s websites. Recently more and more frames have moved towards sloping or semi-sloping top tubes, especially mountain bikes. This makes measuring the actual length of the seat tube an unreliable method for expressing the size of a bike as the more slope to the top tube, the shorter the seat tube (even though the bike would fit the same rider). A third method of measurement has been developed to try and work around this problem.The third method is to assume that the frame has a horizontal top tube (which nearly all frames used to, but now rarely do) and then quote the length that the seat tube would be were it to join with the horizontal top tube. This measurement is often called a “virtual” seat tube length. 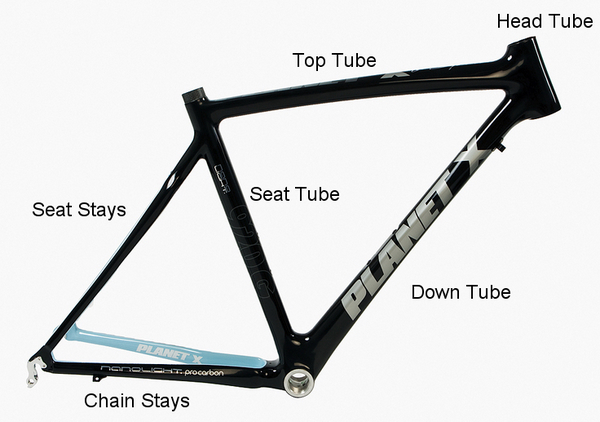 As an example a large Planet X SL Pro Carbon road frame has a seat tube measurement (Centre to Top) of 52cm. When compared to road frames from other brands, it’s actually about the same size to ride as a 56cm Specialized (who use a virtual seat tube length measure centre to centre) or a 58cm Cannondale (virtual seat tube length measured centre to top). With sloping top tubes it makes it possible for even the smallest riders to get the right saddle height on some of the largest frames on the market, so it really is important to pay attention to the length of the frame. If you’re stretching too far to reach the bars then you’ll more than likely end up with back pain and a lot of discomfort. It can get even more complicated when we start talking about frame length but thankfully there’s a new measuring method that takes all the worry away. For those of you interested in knowing why it’s complicated, I’ll outline it quickly here – for the rest of you, feel free to skip the following paragraph! The length of a frame has often been thought to be dictated by the length of the top tube, meaning a longer top tube makes a longer frame. Unfortunately its not quite that simple. An effective top tube is simply a horizontal line connecting 2 points – the seat tube and the head tube. Because these 2 points are on tubes that aren’t parallel, you can change the length of the line between them by moving it up or down; but the 2 tubes you’re connecting haven’t moved. This can be further complicated by frames having different head tube and seat tube angles for different sizes, making it very difficult to accurately compare frame sizes. “Stack and Reach” is fast becoming a new standard of defining frame size that really helps cut through all the trigonometry required to fully understand the bike geometry data provided by manufacturers. Quite simply, stack and reach are two measurements based around the centre of the bottom bracket and the centre of the top of the head tube. The stack is the vertical distance between the two, and the reach is the horizontal distance between the two. These measurements allow us to quickly and easily compare the length and front end height of any bikes without worrying about having to compensate for different tube angles or different tube lengths. Some manufacturers don’t list their frame stack and reach data but you can usually get it from either the manufacturer or the relevant distributor, and the more people that ask for it the more manufacturers will list it on their website as standard – so by sending them an email you’re actually doing us all a favour! Some frames are called Small, Medium or Large but again, I’d probably just ignore the name they give the size and look at the Stack and Reach data. Frames that are called Small might be completely different sizes across different bikes, even within the same manufacturer – meaning a small in one model might actually be the same size as a medium in a different model. This kind of thing happens fairly regularly so it’s always best to consult the Stack and Reach data. Once you’ve decided upon the bike(s) that you’re considering, try to find the frame’s Stack and Reach data and book a Level 1 bike fit at your local Bike Science Fitting Studio – (we’ll be able to help you with the geometry if you can’t find the information). Each of our fitting studios is equipped with an adjustable fitting bike that can be used to replicate any bike from any manufacturer, in any size. We’ll use the data you provide us with to create a virtual bike to try for size before you order. Our Level 1 fitting service takes around 90 minutes and will cost less than 1/10th of the price of an entry level bike and could save you a lot of heartache (and probably back ache). Read more about our levels of bike fit service and book online here. This entry was posted on Saturday, January 1st, 2011 at 7:24 pm	and is filed under All Posts, Bike Fitting, On-One Bikes, Planet X Bikes, Van Nicholas Bikes. You can follow any responses to this entry through the RSS 2.0 feed. Both comments and pings are currently closed.